Next Sunday I will be taking part in another Balham Craft Fair at the fantastic Balham Bowls Club. I blogged about the first fair back in March here and I am really pleased that it looks like this will be a regular feature on the craft calendar. 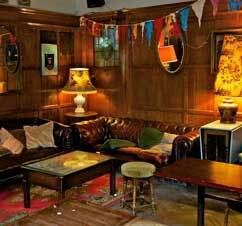 The Balham Bowls Club (BBC) really is a gem of a pub - just look at their website to see the whole range of gloriously quirky events they hold. It has a great 'local' feel and I love the casual and original decor - this is definitely not a run-of-the-mill establishment. The craft fair will be in the upstairs room as before - it has great light and room to sit and enjoy a drink and cake as well as perusing the handmade goods on offer. For those of you planning to attend with babies in buggies, there is a flight of stairs but a member of staff will be happy to help you and your little one up. There are comfy seats a plenty and space for you to move around in comfort - I know how difficult it can be to visit fairs and markets with a child. I wanted to have some more products suitable for toddlers rather than just babies. I have had many favorable comments about the moustache t-shirt I made for Wiss back in October and been asked to make more for other children, so I will be bringing a range of these in various colours with me to the BBC on Sunday. I don't really like making things that are obviously gender-specific so it will be moustaches for the girls too! I am really looking forward to this event and would love to see some of you on Sunday - fingers crossed for some good weather!